The exact origin and relationship between various Celtic tribes is still uncertain and controversial. The earliest undisputed example of a Celtic language are the Lepontic inscriptions (beginning 6th century BC). Celtic tribes settled in large parts of Western continental Europe, the Iberian Peninsula, Ireland and Britain. 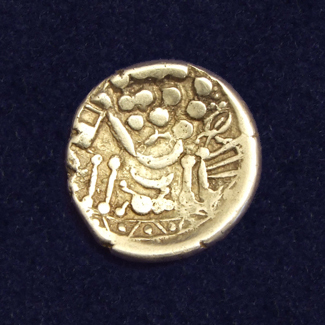 We are focussing on coins and artefacts from British and Continental (Gaul and Rhineland) tribes. 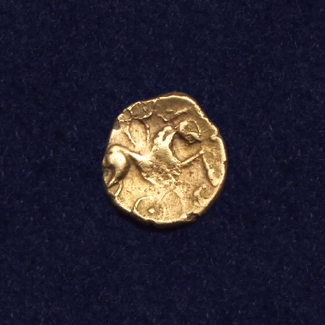 Here you can find a short summary with some examples of coins or artefacts we have sold in the past, or that are currently available on our website. A more comprehensive list of Celtic tribes can be found on Wikipedia. The Durotriges tribe occupied Dorset, south Wiltshire, south Somerset. 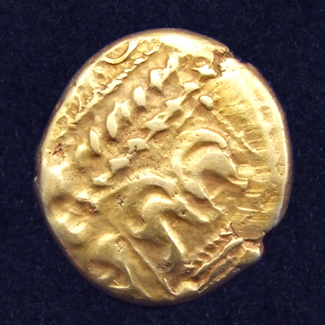 They lived in a mineral-rich area and minted coins well before the Roman invasion. 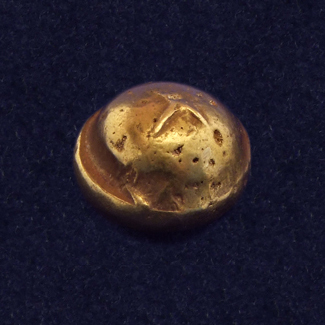 One of the first Celtic mints in Britain was located at Hengistbury Head. 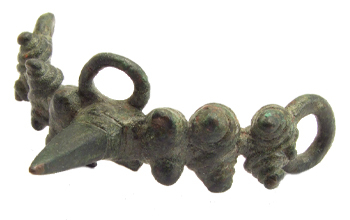 Other metalworking also involved gold, silver and copper alloys as well as the casting of bronze artefacts and ironworking with local iron ore. 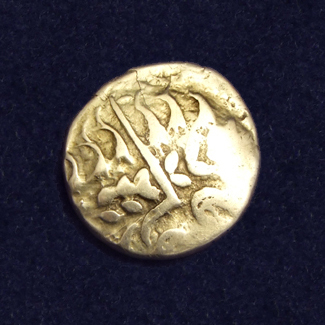 Many coins from this era have been found, interestingly some of which appear to be forgeries with a bronze base given a dip coating of silver. Hengistbury Head was also a main trading port for importing wine, tools and pottery from Gaul and even Italy. The territories of the Durotriges were possessed of an unusual density of powerful hillforts. They occupied some of the most famous hillforts of Maiden Castle, Hod Hill and South Cadbury Castle. They were bordered to the north and east by the Belgae and by the Dumnonii to the west. During the time of the Roman invasion the Durotriges were one of the two tribes that fought against Vespasian and the second legion. The Iceni or Eceni was a Celtic tribe who inhabited an area of Britain (roughly to the modern-day county of Norfolk) between the 1st century BC and the 1st century AD. 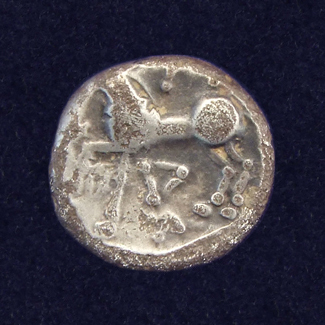 The Iceni began producing coins circa 10 BC. 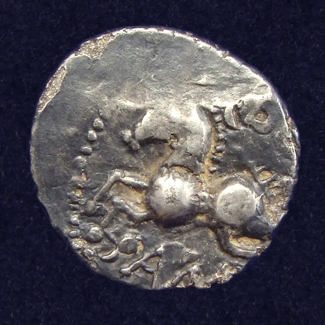 Their coins were a distinctive adaptation of the Gallo-Belgic "face/horse" design, and in some early issues the horse was replaced with a boar. 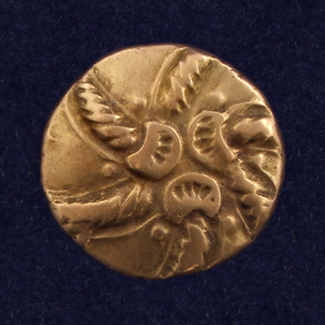 Some coins are inscribed ECENI, making them the only coin-producing group to use their tribal name on coins. Tacitus records that the Iceni were not conquered in the Claudian invasion of AD 43, but they made a voluntary alliance with the Romans. After the death of Prasutagus, a pro-Roman Icenican king, the most famous revolt against the Romans was led by his widow Boudicca (Boadicea) in AD 61. After initial successes agains the Roman Ninth Legion, and the destruction of Colchester, London and Verulamium, Boudicca was finally defeated by the Roman army, led by Paulinus. Addedomarus, ruler of the Trinovantes in the late 1st century BC with territories on the north side of the Thames estuary. The Trinovantes were bordered to the north by the Iceni, and to the west by the Catuvellauni. His name is known only from his inscribed coins. 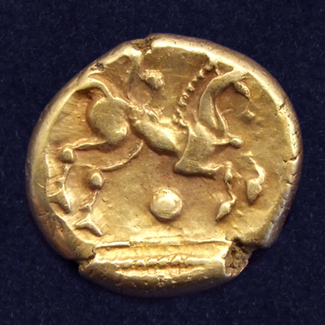 He was the first king to produce inscribed coins north of the Thames, perhaps as early as 35 BC, although some estimates are as late as 15 BC. He seems to have moved the Trinovantian capital from Braughing in Hertfordshire to Camulodunum. For a brief period (ca. 15-10 BC) Tasciovanus of the Catuvellauni issued coins from Camulodunum. 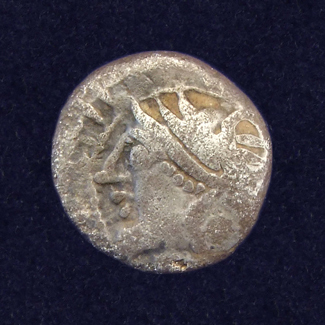 Addedomarus then appears to have regained power and reigned until 10-5 BC, when he was succeeded by Dubnovellaunus. The Ambiani were a sea-faring tribe, living along the lower reaches of the Somme (present day the Picardy region). Their tribal capital was called Samarobriva (corresponds to the modern city of Amiens). 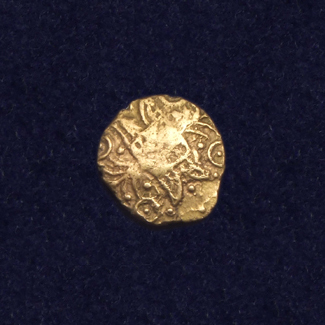 The Ambiani were consummate minters and Ambianic coinage is found throughout the territories of the Belgic tribes (including the Belgae of Britain). In 57 BC the Ambiani joined the coalition of Belgic tribes to fight against the Romans, led by Julius Caesar. 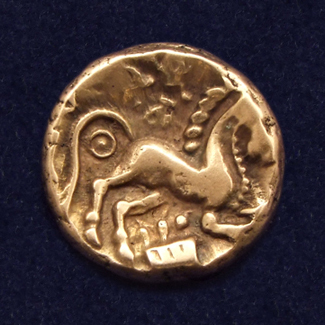 There is some evidence from a coin that bears a stag on one side and a betorced head on the obverse that the Ambiani were followers of the god Cernunnos (horned god). 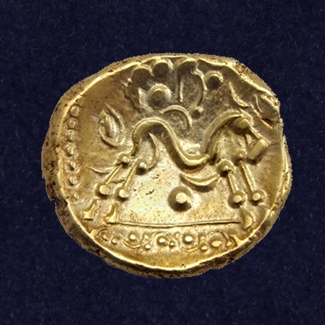 A well-known type of gold staters from the Ambiani are known as "Gallic War staters". They were issued to fund the fight against Julius Caesar in Gaul. The fact that the coins have no obverse design is an indication that these coins were struck in a hurry. The Remi were a Belgic tribe of north-eastern Gaul in the 1st century BC. They occupied the northern Champagne plain, between the rivers Mosa (Meuse) and Matrona (Marne), and along the river valleys of the Aisne and its tributaries the Aire and the Vesle. Their tribal capital was at Durocortum (Reims, France) and they were renowned for their horses and cavalry. The Remi, under Iccius and Andecombogius, allied themselves with Julius Caesar when he led the conquest of Gaul. The Remi tribe remained loyal to him throughout the entire Gallic Wars, the most pro-Roman of all the peoples of Gaul. The Celts were defeated at Telamon, which was the end of Celtic power in Italy. 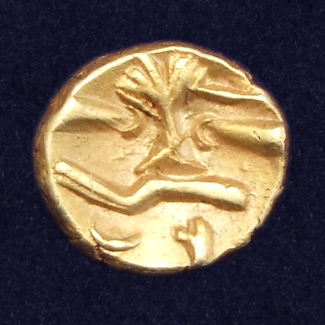 3 Examples of electrum ¼ staters of the Remi tribe. The Senones tribe were a nomadic tribe, related by blood to many other Celtic tribes (Lingones, Aedui, Sequani, Ambarri, Aulerci, Carnuti and Turoni). By the 8th century BC, the Senones were settled around the Loire, Seine (Sena) and Yonne river. By the 4th century BC the Senones and Lingones also settled around the Garonne river. Many male and female warriors followed the Boii and Lingones over the Alps. They destroyed the Etruscan town of Meltum (Melzo), founded Milan and settled along the Adriatic coast (Sena Gallica, now Senigallia). In 232 BC the decision of Rome to evict the Senones led to the Gallic invasion over the Alps in 225 BC. They contributed warriors to the Celtic army during the siege of Alesia. 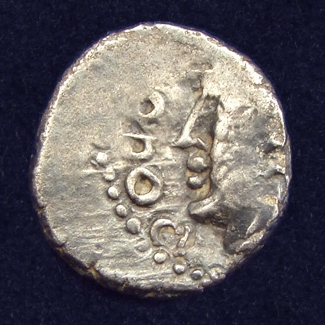 Some of the Celtic tribes that maintained close relations with Rome issued equivalent coins to facilitate trade. The Sequani asked for Caesar's help against Ariovistus but later they joined Vercingetorix' party against Caeser at Alesia. Together with the Senones, they contributed around 12.000 warriors to attack the rear of Caesar's forces at the siege of Alesia.